WALNUT (Juglans regia). Hedging Plants, Trees, Shrubs and Conifers. Large deciduous handsome tree, young aromatic leaves coloured bronze turning to bright green. 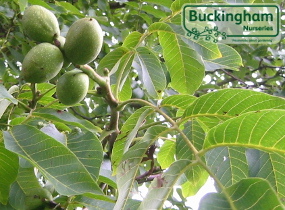 Greenish yellow male and female flowers borne separately on the same plant in late spring and these are followed by walnuts on mature trees. Any fertile well drained soil. Self-fertile. See Walnut Rita for grafted variety. TREE 20ft x 12ft (6m x 3.7m) in 20 years, ultimate height 100ft (30m).